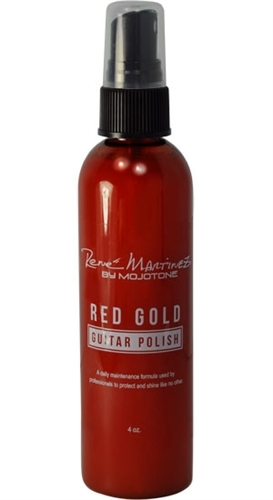 René Martinez "Red Gold" Guitar Polish is an all organic solution that contains absolutely no silicone or wax. Wipes off clean, without leaving behind streaks or waxy residue. Non-abrasive guitar polish designed for everyday use. Safe to use on all finished or unfinished wood. A daily maintenance formula used by professionals to protect and shine like no other. "This polish was meant for cleaning up guitars everyday. On stage there were always fingerprints and sweat from the previous show and I needed something to clean guitar finishes without using wax. Red Gold was the answer! I go way back to my teen years when I started using polishes for finishes. I was always on the hunt for new polishes and waxes to bring out the finish beauty and also to protect them. Red Gold was the final polish I have been using for many years now. There is no wax in this product to build up on your guitar. It cleans well and smells good, too! Perfect for everyday cleaning!"